Professional installation development software for creating small setups! 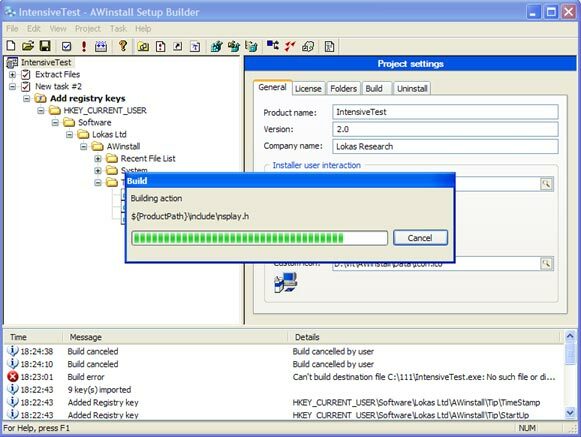 With AWinstall you can create compact and intelligent setups for delivering your software on removable media or via Internet. It combines the minimal installer footprint (just about 30 KBytes!) with robust and user-friendly development environment. Support for installing uncompressed files (useful for CD distributions); new! Small package size: typical installer footprint is about 30 Kb! Built-in automation model for extending setups with ActiveX scripts (VBScript and JScript); new! Extracting files with full paths (with subfolders auto-creating).